Fort Charles Bundy | Batería de Cabo Rojo | Cabo Rojo Fort | Cabras Island Res. Batería de Puerto Real | Batería del Puerto | Punta Cangrejos Res. | Punta Escambrón Res. A Spanish colonial fortification built before 1828, when it was repaired. Also known as Batería de Cabo Rojo. A Spanish colonial fortification at Boca Morena. Also known as Batería del Puerto. It was built sometime before the 1821 slave revolt in nearby Bayamón. The Powderhouse was built in 1825. It was reported destroyed in the 1918 earthquake and tsunami. No remains. The town was founded in 1760. Battery Algarrobo, a four-gun 155mm battery on Panama mounts, was located three miles northwest from the city. The short-lived Casa Fuerte del Higuey was built here in 1506, the first known Spanish fortification in Puerto Rico. The old town was founded in 1511. A fort was ordered built in 1514, but was probably not begun until 1529, after the French had sacked the town in 1528. (NOTE: The present town of San Germán was founded/relocated in 1573. A Spanish colonial fortification. No remains. A Spanish colonial fortification. Attacked in 1825 by Colombian privateers. By 1890 it was used as a local police barracks. The town was founded in 1775. Fuerte (or Batería) de San Carlos was previously here when the British attacked the town in 1797. A U.S. Army garrison post until transferred to the local defense force. This was probably the police barracks, the former Fuerte de la Concepción. Battery Aguada, a four-gun 155mm battery on Panama mounts, was located 4.5 miles southwest from town. The battery site is currently owned by the Puerto Rico Dept. of Natural Resources. A U.S. Army Air Corps airfield. Battery Borinquen, actualy two two-gun 155mm batteries on Panama mounts, was located here in 1941, site of the east battery now a dedicated WWII memorial (2014) at the U.S. Coast Guard Borinquen Air Station. The west battery was located on the former military 9-hole golf course (now the public Punta Borinquen Golf and Country Club). Several 3-inch AA, and 105mm and 75mm field guns, were also located here. The airbase later became Ramey Air Force Base in 1948. Now the Rafael Hernández International Airport. It has the longest runway in the Caribbean region (11,700 feet). A Spanish colonial fortification, built after a British naval attack of the town in 1702. Rebuilt/enlarged in 1813. Destroyed in 1881, site now Paseo de Damas. The Powder House still partially exists, now derelict and in ruin (2010) adjacent to a parking lot. The town was founded in 1606. A Puerto Rico National Guard training camp, used by the 295th and 296th Infantry Regiments. The US government acquired the site, located northeast of Lake Tortuguero and contiguous to the Atlantic Ocean, in 1941 for use as a small arms firing range. When the Army no longer needed the site, the use of the range was licensed to the Puerto Rican National Guard between 1947 and 1976, and it was used as a small arms firing range. The lease was terminated in 1980, and the property was transferred to the Puerto Rico Land Authority, in lieu of restoration. The 107-acre site is five miles northwest of town. The property is now privately-owned and has been fully developed. The Vega Baja Auxiliary Field (1941 - 1956) was built by the U.S. Army Air Corps. The site was used by the PR National Guard from 1956 until 1975 for training purposes. A Spanish colonial fort was once located at Punta Salinas on what was then known as Isla Batería. The ruins were still evident in 1937, but were finally destroyed by the U.S. Army in 1941 to build Fort Mascaro. This fort at the entrance to San Juan Harbor was originally a wooden structure which was destroyed by the Dutch in 1625. The present structure, Fuerte San Juan de la Cruz, was built of stone in the 1670's. The original islet was later connected to the larger nearby Isla de Cabras by a rock causeway in 1935. Public access to the old fort's interior is currently restricted. Castillo de San Felipe del Morro towers 140 feet above the sea. It is a six-level maze of tunnels, dungeons, barracks, outposts and ramps covering 200 acres. Admission fee. Attacked by the English under Francis Drake in 1595 but repulsed. The fort was captured only once - by land, in 1598 by the English and held for three months. Attacked by the Dutch in 1625 but repulsed again, although the city itself was sacked. Most of the present fortifications were built between 1587 and the 1650's. The original fort was a large square tower with a circular gun battery at the water, completed in the 1580's, although its first guns were installed in the 1550's. The original Hornwork was constructed in 1589, with two half-bastions (Tejada/Ochoa and Austria) and a ravelin. The "V"-shaped Santa Bárbara Battery comprises the third level of the fortress above and behind the old Water Battery. The Carmen Battery is on the fourth level facing the sea. The small Texada Battery faces the sea below Carmen Battery. The Santa Elena Battery, built in 1586, was located outside the Hornwork, between it and Casa Blanca. The Santa Elena Powderhouse (1783) is also located here. The last improvements to the fortress were made in 1790. The old fortress was later a component of Fort Brooke (see listing below). In WWI the U.S. Army had emplaced two 4.7-inch Armstrong guns here, one mounted on the Santa Bárbara Battery, and the other mounted on the Santa Elena Battery. Both guns were scrapped in 1919. In WWII one 3-inch gun was emplaced on the old Armstrong mount at Santa Bárbara (Battery Point), and a HECP and three artillery fire-control stations were built on the outer walls of the main fortress, above the Carmen Battery. 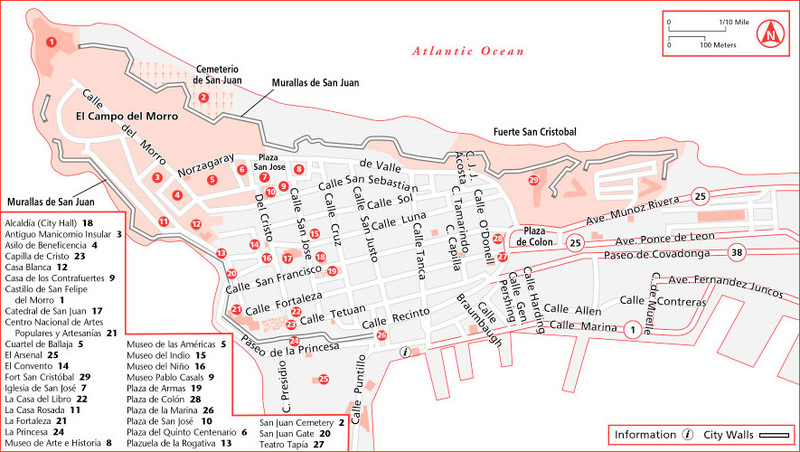 Named bastions (baluartes) located along the perimeter of the walls are/were known as (clockwise from El Morro to San Cristóbal): San Antonio (1742); Santa Rosa (1776); Santo Domingo (1778); Las Animas (1778); Santo Tomás (1780); San Sebastian (1780); Santiago (1639) (destroyed 1897); San Pedro (1639) (destroyed 1897); San Justo (Left / Izquierda) (1639) (destroyed 1897); San Justo (Right / Derecha) (1636); Las Palmas (1635); La Concepción (1640); Santa Catalina (1640); San Agustín (1640); Santa Elena (1590, 1635, 1778); and San Fernando (1742). Outside the wall between the Santiago and San Pedro bastions was the Batería de San Francisco de Paula (1796) (destroyed 1897). The former gates (puertas) were known as: Santa Rosa (1870) (between the Santa Rosa and Santo Domingo bastions); San Jose (1877) (at the Santo Tomás bastion); Santiago (1639) (at the Santiago bastion) (destroyed 1897); San Rafael (1874) (between the San Pedro and San Justo (Left) bastions) (destroyed 1895); and San Justo (1639) (between the two San Justo bastions) (destroyed 1894). Detached powder magazines (polvorins) within the walled city were: Santa Elena (1783) (behind the Santa Elena bastion) (still extant, administered by the NPS); and San Sebastian (1791) (behind the San Sebastian bastion) (abandoned 1880, later destroyed to build the Abraham Lincoln Public School). Before the completion of the walls, Fuerte del Morrillo (1600's ?) was once located at or near where the Santa Rosa bastion is now located. Fuerte de la Perla (1600's ?, rebuilt 1776-92, demolished 1867) was once located between the Las Animas and Santo Tomás bastions, in the present-day La Perla community. Also known as the Palacio de Santa Catalina, part of this mansion was originally built as a defense against native Indians, which consisted of a medievel-style castle with a round tower. It was originally completed in 1540. A second tower (Austral Tower) was built in the 1590's. The rest of the structure was built in 1846 to serve as the governor's palace. It is the oldest executive mansion in the Western Hemisphere still in use. The fort was captured by the English in 1598, and burned the Dutch in 1625 when they failed to take El Morro Castle. The island's governor (Captain-General) has typically lived here since 1640. The original tower, Torre del Homenaje, still stands, so named for the tradition of the resident governor to climb to the top to pledge a solemn oath of loyalty and courage during dangerous times. Partial public access during group tours. The "White House" was a square stronghouse (casa fuerte), originally the home of the family and decendants of Juan Ponce de Léon, the island's first governor. Since 1779 this building has been the residence of the commanding generals of both the Spanish and the American militaries. It was used as the Governor's Mansion after WWII. In 1967 became a house museum operated by the Institute of Puerto Rican Culture. Admission fee. Originally built by the Spanish Navy. Masonry construction replaced temporary wooden buildings in 1800. Later became a defensive citadel for the naval base. This was the last Spanish post in the city that was captured by the U.S. Army in 1898. It is now a museum and cultural center. Nearby at La Puntilla was once located Batería de Santo Toribio (1826-1883). No remains. Earlier gun batteries were also located here in 1625 and 1797. The Ballajá Barracks were originally built as Spanish infantry barracks for 1000 men to ease overcrowding at the forts. It is a three-story square building with large gates on two ends, ample balconies, designed with a series of arches and a protected central courtyard that served as a plaza and covers a reservoir. Facilities included Officers' quarters, warehouses, kitchens, dining rooms, prison cells and stables. After the Spanish-American War, the U.S. Army used Ballajá to house its infantry division. In 1943 it was converted into a military medical facility, known as the Rodriguez Army Hospital, part of Fort Brooke. Today it is used by the University of Puerto Rico, and it also houses the Museum of the Americas (opened October 12, 1992) on the second floor, as well as other organizations. The old fortress was later a component of Fort Brooke (see listing below). In WWI the American Army had emplaced one 4.7-inch Armstrong gun at Battery Princesa (scrapped in 1919). In WWII a 155mm gun battery on Panama mounts was later built on Battery Princesa, and two artillery fire-control towers were built on the outer walls of the main fortress, on the Cavalier Battery. A Spanish redoubt located at Punta Escambrón. Three guns were active here in 1898. A WWII steel-frame fire-control tower was built within the redoubt in 1942 (dismantled in the 1950's). The interior is not open to the public, although the grounds can be walked. Restored in 2003. Nearby was Batería de San Ramón (1779), once located on a small hill just to the northwest (destroyed in 1940 except for a single stone garita on the grounds of the Caribe Hilton Hotel). The Cuartel Defensivo de San Ramón was built here in 1898. No remains. The San Gerónimo Powderhouse was one of four brick and masonry magazines built by the Spanish. The rectangular building features a vaulted interior supported on both sides by ten massive buttresses. It was once connected to Fuerte San Gerónimo by a line of defensive trenchworks. In 1935 the former magazine was used as the Museum of Natural History, then became a zoo in 1945. It was restored in 1994 by the Puerto Rico National Parks Trust. Located within Luis Muñoz Rivera Park in the Puerta de Tierra area. A small Spanish fort located southwest of Fort San Gerónimo, at the north-end of the San Antonio Bridge. Mostly destroyed by the construction of modern bridges after 1894. Still shown on 1898 battle maps. A small section of the remaining battery parapet was restored in 2012. This was the U.S. Army's main garrison post, centered mainly around the historic El Morro and San Cristóbal Castles. Originally known as the San Juan Military Reservation. Renamed in 1943. The Americans built a harbor entrance control post (HECP) and Battery Point (a three-inch gun mounted on an older 4.7-inch Armstrong gunblock) on the old El Morro fortress, as well as three fire-control stations (one still exists). Located at San Cristóbal Castle were two fire-control stations (still here), and a 155mm gun battery on Panama mounts. Numerous barracks and quarters covered the open plain below El Morro ("El Campo del Morro"). The old Ballajá Barracks became the Fort Brooke Army Hospital (aka Rodriguez Army Hospital) in 1943. The Convento de los Dominicos, originally built in 1523, was used in WWII as the administrative headquarters of Fort Brooke and the U.S. Army Caribbean (Antilles) Command. It is now a museum. Most of the historic areas of the post were nominally transferred to the NPS in 1949. Located here was Battery Schwan / 263 (1942 - 1949, destroyed 1965) at Punta Escambrón near Fort San Gerónimo. A hotel swimming pool is now on the site. Located here was Battery Lancaster / 264 (1942 - 1946) on Punta Cangrejos, north of the east-end of the runway at Luis Muñoz International Airport. The abandoned battery was later used as an aquarium from 1970 - 1975. The battery still remains, now overgrown in an area of private businesses and restaurants. World War II batteries here were Battery Reed (1941 - 1948) (casemated 12-inch guns) (still exists); a 155mm Panama-mounted gun battery nearby; and an Anti Motor Torpedo Boat battery. A secondary harbor entrance control post (HECP) with an SCR-582 radar was also located here. Originally known as the Cabras Island Military Reservation until 1943. This site is now used as a local police training area and shooting range. World War II seacoast batteries here are Battery Buckey / 261 at Punta (Point) Salinas, and Battery Pence / 262 on East Salinas Island. Both still remain, built on by modern communications and radar installations (since 1964). Two fire-control towers were once located on Punta Salinas. Originally known as the Punta Salinas Military Reservation until 1943. The fort is now in use as a PR Air National Guard radar site. No public access. ¤¤¤ ALSO: Additional fire-control towers for the San Juan Defenses were once located at Vacia Talega, Punta Maldonado, Punta María (four), and Punta Escambrón, all east of Old San Juan. Those located west of Old San Juan were at Punta Fraile, and Punta Cerro Gordo. None remain. Battery Punta Cataño (AMTB) (1942 - 1943) was located in Cataño. A Spanish masonry powderhouse, protected by the nearby Batería de Miraflores (built before 1797). Used by the U.S. Navy after 1898. Overgrown ruins are located in the Miramar area, now encompassed by the Aeropuerto de Isla Grande. A training camp for the Puerto Rico Regiment of Infantry (later the U.S. Army 65th Infantry Regiment). Located in the Santurce area. Became a public housing project in 1950. The short-lived Casa Fuerte de la Torrecilla was located here. Originally known as Camp Miles until 1926. Redesignated a fort in 1940. Permanent structures built in WWII. It was the main garrison post of the U.S. Army's Antilles (Caribbean) Command after WWII, until 1966. The post was then under U.S. Navy control from 1966 to 1971. Became the headquarters post of the U.S. Army Southern Command (transferred from Panama) from 1998 to 2002. Still in use by the Army Reserve. The Army first acquired property to construct Fort Buchanan in 1925. It was initially used for target ranges, but as war efforts expanded (including World War II and the Korean Conflict), additional land was obtained to accommodate additional activities. Fort Buchanan reached 1,818.54 acres and housed a general depot, an induction center, and a training center. Following World War II, the post provided administrative support for all technical service within the Antilles Command, the Army Terminal for Water Transportation, the US Army Personnel Center and the US Army Training Center, Caribbean. When the 65th Infantry Regiment returned from Europe, the first battalion was moved to Fort Buchanan. By 1949 Fort Buchanan’s military port and general depot received and shipped commodities for all of the Army and Air Command Stations in the Caribbean. In 1945 the Army began terminating leases and disposing of excess land through the General Services Administration, eventually shedding 1,037.44 acres. The remaining land houses the still active post. A WWII training camp for the PR National Guard. A Spanish colonial fortification. Also known as Batería de Puerto Real. Probably built to control local smuggling that was widespread between Puerto Rico and other nearby islands. Still reported in use in 1830. Originally named Camp Ensenada (1943), renamed in 1944. World War II seacoast defense batteries on the mainland planned but not built were Battery 152 at Punta Mata Redonda, Battery 155 at Punta Yeguas, Battery 311 at Cabo (Cape) San Juan, and an Anti Motor Torpedo Boat Battery. Batteries that WERE built included Battery 406 (1943 - 1947) at Punta Mata Redonda (the magazine was not built, battery now overgrown); Battery 265, with an SCR-296 radar, on Isla Piñeros; Battery 268 (1943 - 1947, never armed) at Punta Lima (site now a prison); a two-gun 155mm Panama mounted gun battery at Punta Yeguas; and an Anti Motor Torpedo Boat Battery and harbor entrance control post (with SCR-582 radar) at Punta Algodones. The following World War II seacoast defenses were planned for Vieques Island but never built: Battery 153 on Mt. Pirata, Battery 154 at Cerro Matias Jalobre, Battery 266 at Cerro Martineau or Punta Mulas, Battery 267 at Punta Arenas or Mt. Pirata, and Battery 285 on East Point (Punta Este). Most of Vieques Island became a U.S. Navy/Marine base and a gunnery and bombing range in 1940 (renamed MCAS Camp Garcia in 1959), which was closed down in 2003 after public protests. These World War II seacoast defenses were planned but never built - Battery 312 at North Point, and Battery 313 at Dolphin Head. Culebra Island became a U.S. Navy gunnery and bombing range in 1940, which was closed down in 1975. ¤¤¤ ALSO: Coast Artillery fire-control towers/stations were once located at Punta Puerca and at several other locations on the former Roosevelt Roads U.S. Naval Base. A concrete fire-control station is still located within the Humacao Nature Reserve to the south. A lookout tower is also located on Icacos Island (according to current tourist guides), but it may possibly be a Civilian Conservation Corps-built tower from the 1930's. The short-lived Casa Fuerte del Daguao was located here, built by Juan González Ponce de León. It was abandoned after attacks by Carib and/or Taino Indians. A Spanish colonial fortification. Still used by 1830. A Coast Artillery anti-aircraft gun training site during WWII. Originally a Puerto Rico Volunteer Infantry Regiment post named Camp Henry. Later became a U.S. Army infantry post in 1908 (for the 65th Infantry Regiment) and renamed. Now the campus of the University of Puerto Rico at Cayey (since 1967). The approximately 389 acres required to create an Army post were formally acquired in 1903. The Army constructed a complete military facility consisting of approximately 190 structures including ammunition storage, waste water treatment, vehicle maintenance, sanitary landfill, various other miscellaneous support facilities, housing and improvements such as roads and utility systems. The reservation was primarily used for infantry training. By 1968 all the acreage had been deemed excess and was turned over to the General Services Administration for disposal. Several public and private sector entities now own portions of the former military reservation. The Puerto Rican National Guard Armory and the San Juan Geophysical Observatory are located on the site along with residential, commercial and educational facilities. A former U.S. Army Air Corps auxiliary air field located two miles east of the city. Now the NHRA Puerto Rico International Speedway. A PR National Guard training center and bombing range. Originally named Camp Salinas (or Camp James under the U.S. Army, and later U.S. Navy), until renamed in 1975 and transferred to the PRNG. Collazo Air Field is also located here. The Puerto Rico National Guard Museum is located on post. A former U.S. Army Air Corps auxiliary field. Became a civilian airstrip after the war. Now abandoned (?). A Spanish outpost captured by the U.S. Army. It was a wooden farm building surrounded by trenches and barbed wire. There were several additional small blockhouses and guard posts around here as well. No remains. Originally Losey Army Air Field (1941 - 1944). Transferred to the Army Ground Forces in 1949 and became Camp Losey. Renamed in 1959. Became a U.S. Naval Radio Station from 1962 to 1980. In 1980 the post became an INS processing center for Haitian refugees. Transferred to the PR National Guard in 1983. Now home to the Puerto Rico National Guard Military Academy, Officer Candidates School, and NCO Academy, as well as serving as an Army Reserve supply depot. A Spanish colonial fortification at Punta Peñoncillo. Also known as Batería de San José. Still in use in 1846. Spanish two-story military barracks located on Castillo Street in the Bario Quinto area. After the Spanish-American War it was used as a courthouse and later as a jail until 1987. Since 1992 it now houses the Escuela de Bellas Artes (Ponce School of Fine Arts). The building is known locally as "El Castillo". A four-gun 155mm battery on Panama mounts was located 1.5 miles west of Ponce Harbor, the site of which is now a water sewage treatment plant. A Spanish colonial fortification on the Bahía de Tallaboa at Puerto de Matanzas. An English earthwork fort or fortified encampment, possibly named Fort Elizabeth. The roughly 600 men under Ralph Lane and Sir Richard Grenville, in six ships, stopped here in May 1585 for about two weeks to pick up fresh water and foodstuffs, and for ship repair, before heading north to the North American mainland to establish the first English colony in the New World (at Roanoke Island, North Carolina). Located at the mouth of Río Tallaboa. No remains. Another fortified encampent was constructed by Ralph Lane and 25 men (with six Spanish prisoners) at Cabo Rojo around a captured Spanish saltworks. Used for only three days before the expedition left. Exact location undetermined, probably near Bahía Salinas. The layout of this fortification is said to have closely resembled the layout of Lane's Fort on Roanoke Island, North Carolina, which was built in July 1585. A Spanish colonial fortification. Also known as Fortín de Guayanilla. An electric powerplant is now located at the presumed site. The town was separated from Yauco in 1830. Batería de San Fernando was located here or nearby in 1811. A temporary U.S. Army command post at the initial landing place of the Americans in Puerto Rico during the Spanish-American War (July 1898). This area may have been the location where Christopher Columbus first set foot in Puerto Rico in November 1493 (also claimed by the town of Aguada). A stone lookout tower is located on a three mile-long trail within the Guánica Public Forest, a 10,000 acre subtropical dry forest and wilderness preserve. It was originally built by American troops in 1898 as a memorial to Capt. Allyn Capron who had been killed in Cuba. Restored in the 1930's by the C.C.C..
During WWII there were at least five sites around the island that were emplaced with the U.S. Army's SCR-270 (mobile) or SCR-271 (fixed) early warning anti-aircraft radar sets, operated by the Signal Corps' 559th Air Warning Service (AWS) Battalion. Locations undetermined.